Health and wellness seem to have become the national obsession. That’s not because we’re so horribly unhealthy, but because there is tremendous profit, along with power and control, that can be waged over a population when people can be convinced to believe that health is a matter of personal responsibility and good behavior ... that chronic diseases can be prevented by living a “healthy” lifestyle and eating “healthy” … that those who are healthy have idealized characteristics (health indice measures as seen in 20-year old white people of privilege), and everyone else — ageing, minority, fat, disadvantaged or sick — are seen as ill-behaved, ignorant and indulgent masses burdening the rest of society. Health and fitness becomes a duty to society and the common good, and those who aren’t become enemies of the state and are viewed as diseased and inferior, and in need of oversight and management. 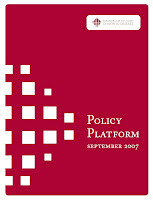 As America's population grows and, as the aggregate profile of its citizens ages, Americans' behavioral choices, the availability and access to good health care and health information, and the resulting incidence of chronic disease will all have a substantially important bearing upon the national economy, the nationwide employment base, mortality trends, and other demographic factors. The Future. Should the incidence of chronic diseases expand along with the rapid rate of growth in the country's population, especially among ethnic and low-income communities, an impending national health care crisis could confront future generations. Mortality rates could rise, average life spans contract, medical costs skyrocket... severely impacting every aspect of society – from the nation's overall health care infrastructure to the national economy. The Good News. Experts tell us that good nutrition, regular physical activity and exercise, better health care awareness, and improved health maintenance and disease prevention routines should reduce or alleviate the potential for serious chronic illness within the population as a whole, along with associated costs. Good lifestyle behaviors can help ensure that the health of the nation's population overall improves over time, that health care costs will stabilize, and that the current strains upon our health care system will be significantly reduced. Changing the way the nation approaches chronic disease prevention and management will require the participation of the multiple groups that have a stake in, and an influence on, Americans' health – including our nation's policymakers and business leaders. The “right steps” they envision are taking us to a Medizinischepolizei. More on that coming up.